This is e-book #2 in Devin Knight's "Magic Marketing For Magicians Series". Almost everyone is on Facebook nowadays and odds are you have a Facebook account. But are you using it to properly promote your entertainment business? Do you even know how? Sadly, most entertainers don't realize the full potential of Facebook. To them, it is a place to shoot the bull and play games, but did you know that the proper use of Facebook could double the amount of shows you do in a year? No, this isn't hype, this is a hard fact. The trouble is most performers aren't even aware of how this can be done! Just being on Facebook isn't enough. You have to know how to properly promote your act using techniques that are available to you and described in this new e-book. You need to know proven techniques that work and are working for entertainers and major companies world-wide. Facebook has become the largest social network in the world with over 1 billion users, of which half of them visit the site daily! Facebook is becoming so large that it recently overtook Google as the website that got the most traffic in a single day! That means that Facebook is becoming bigger than Google itself! How would you like a piece of that pie? Selling your act or show is a numbers game and if you are not tapping into the Facebook market, your competition will leave you in the dust! Having Facebook as a part of your marketing strategy is no longer an option. It is now a necessity if you want to succeed as an entertainer! A whopping 74% of all consumers now rely on Facebook to guide their purchasing decisions. That's right Facebook users are buyers for your entertainment services - and you can easily attract them. There are many ways to market on Facebook. Some ways are absolutely free and some will cost you money. In this new e-book veteran Internet marketing expert, Devin Knight, shows you both ways and teaches you insider secrets that will skyrocket the amount of shows you do! Whether you are a magician, juggler, clown, hypnotist, musician, or even a face painter, you will discover ways to get floods of laser-targeted traffic and easily increase your shows. Devin will teach you how to achieve instant celebrity status almost overnight using a simple technique that is available for FREE to any performer. The bottom line is, if you are not using this lucrative way to market your act or entertainment service, then you are leaving loads of cash on the table. Period. Easily do it yourself with no website building knowledge - guaranteed! The best news is that you can do this now, even if you don't currently have a working website! Devin shows you step-by-step how to create a "Facebook Fan Page." You don't have to know anything about building websites either. So for those of you who are computer challenged, you can do this from the comfort of your home without having to pay some computer expert to build you a website that is SEO friendly. If you know how to post on Facebook, you can create a Free Fan Page. It's that simple. Devin even tells you what to post on your fan page that will drive hoards of people to your page, eager to book your services. He also tells YOU WHAT NOT TO POST ON FACEBOOK. Many performers are unknowingly losing shows, by posting certain things on Facebook. You will learn how to avoid these mistakes that will cost you money and a loss of important shows. These techniques are more effective than being on the first page of Google. No kidding! In this e-book you will learn the insider secrets behind Facebook Ads. Facebook has proven to be far more effective and cheaper than Google Ads. Devin will show you how to create ads that only appear on user's page who are looking to hire you. Facebook allows you to target users in certain demographics, within certain age ranges, so that only they see your ad and nobody else. No more wasted money on costly ads that have broad exposure but only appeal to a few of the viewers. Maybe only 50 people will see your ad, but these 50 people are ones that are in the market to book you. Facebook Ads are the most effective form of advertising on the Internet today and you can reach targeted users for just a few dollars a day. These are not pipe dreams, but proven techniques that savvy entertainers are using now to fill their calendars with paying bookings. You can become part of this elite group of Facebook winners with the techniques revealed in this book. Are you ready to take your performing career to the next level? If you are really serious about getting more bookings, then getting this e-book is a no-brainer. 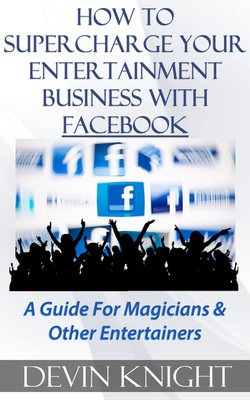 This is the definitive book on Facebook for entertainers. Stop wishing you had more shows and start doing something about it today. This e-book tells you everything you need to know to start getting bookings within days from Facebook users. This could be one of the smartest investments you have made in your career. NOTE: Although this e-book was written with the entertainer in mind, these techniques and secrets will work for any business. So if you want to promote your car dealership, your restaurant, etc. You can use the information in this book to skyrocket your business and create thousands of loyal fans and customers. 1st edition 2013, 36 pages. PDF sent to your e-mail for only $9.95 Click below to order via PayPal. I accept Master Card, Visa, Discover card. If you wish to e-mail your order, split your number into two emails.